I think I'm in love again with a new tangle. Or perhaps I'm just partial to spirals. 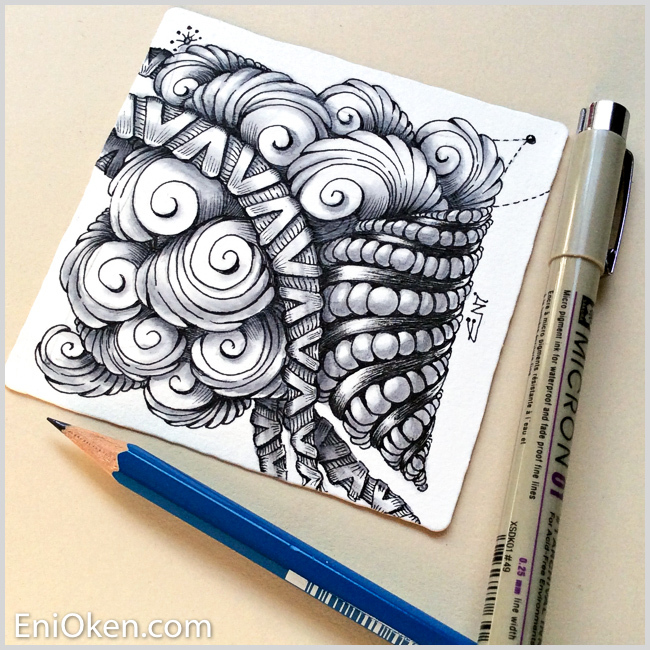 I recently discovered this tangle pattern Joki, (deconstructed by Kim Aarts here). It's just like drawing fluffy clouds, light and airy! I combined Joki -- which is an organic fill pattern -- with Claws (I believe this is a tangle deconstructed by Elena, but I could not find a direct link, only a Pin on Pinterest here) and Purk (Zentangle HQ). And here is another picture of the final tile. Was sooooo much fun to create this tile using Joki!